This Examination Special train (Train No. 08037) leaving Shalimar at 13.00 hrs on 19th ,21st, 23rd, 25th,27th and 30th September 2018 will reach Bhubaneswar at 21.15 hrs the same day. 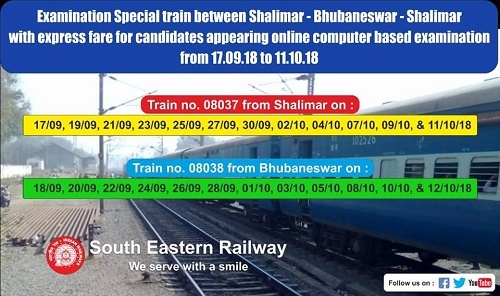 Similarly, in the return direction, 08038 Bhubaneswar-Shalimar Examination Special train will leave Bhubaneswar at 20.00 hrs on 20th,22nd, 24th,26th, 28th September, and 1st October, 2018 arriving Shalimar at 4.30 hrs ,the next day.